Many years ago I read a book called ‘Dress for Success’ by John T Molloy which I understand has now spawned into several editions covering separate versions for men and women and updating the changes in fashion over the last 20/30 years since the original. 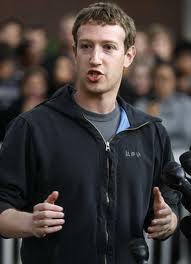 It was with interest therefore, that I’ve been reading today about the criticism of Mark Zuckerberg for wearing a “hoodie” to this weeks presentations to talk up Facebook’s floatation, its first major sale of shares. Some observers were quick to suggest that this was perhaps a mark of immaturity or of not really caring … Might I suggest, however, that at the age of 28 and with the floatation potentially valuing Facebook as high as $100bn (£62bn), he can wear what the hell he likes and all the suits in the world won’t change his amazing success! Posted on May 11, 2012, in Facebook, General and tagged $100bn, £62bn, Dress for Success, Facebook, John T Molloy, Mark Zuckerberg. Bookmark the permalink. Leave a comment.